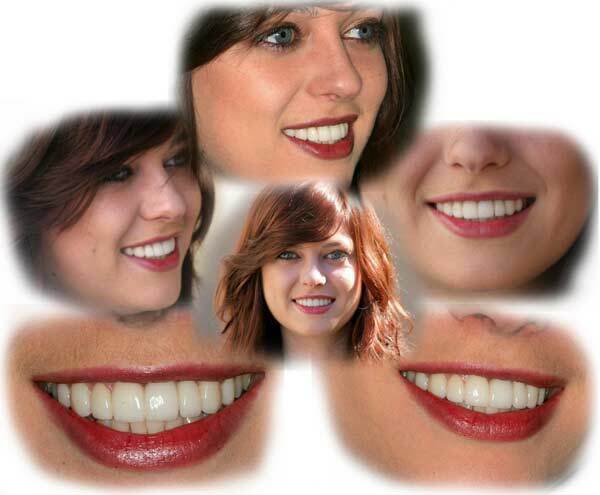 Veneers are thin ceramic facings bonded on the front teeth to improve their appearance, color and shape. Conservative: Due to the fact that there is minimal grinding of tooth structure, sometimes not even any, it is probably the most conservative procedure in dentistry. Impact: It is the only procedure that achieves so much with so little. 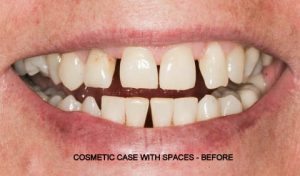 Customizable: Veneers are fully customizable, meaning that the wishes of the patient can be followed, such as choice of color, shape and size. 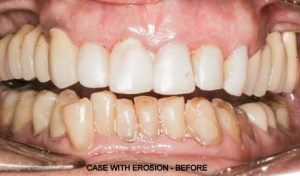 Whether the patient wishes totally natural-looking teeth to blend with the other teeth, or a “million-dollar-smile” with snow-white teeth, or anything ranging in-between, it can be done. 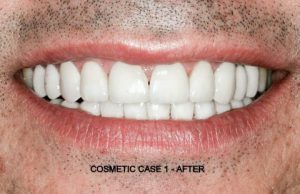 Biocompatible: Veneers are made from the most biocompatible of ceramics, low-fusing feldspathic porcelain or lithium disilicate pressed ceramic. Well-formed jaws which are not backward or underdeveloped. White teeth with BROAD smiles. Their teeth fill out the whole smile frame. There are no shadows when they smile. Who are candidates for veneers? Teeth which are: discolored; irregularly shaped; smaller than average; shorter than average; worn down; spaced; cracked; enamel worn away by acids. 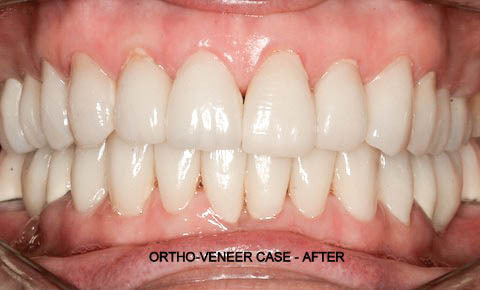 Basically, anyone who wants to have a new smile can have veneers for cosmetic reasons. 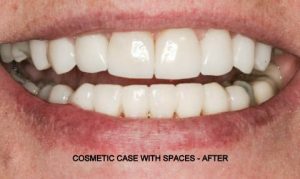 Many times, however, it is a necessity, and they also serve a protective function, in cases where the teeth have multiple cracks, damage or erosion. Does one need to whiten their teeth before veneers? Not necessarily. However, if the teeth are too dark to begin with, a course of whitening would improve the results. 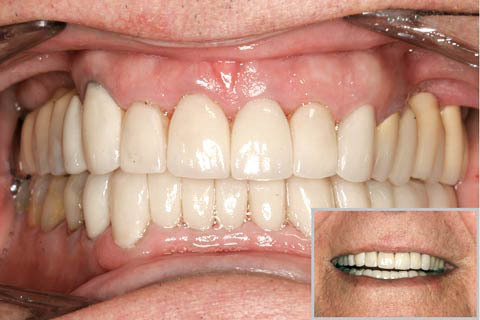 In cases of tetracycline staining, whitening or veneering alone will not do it. Both will be needed to achieve good results. Can someone with crowded teeth have veneers? 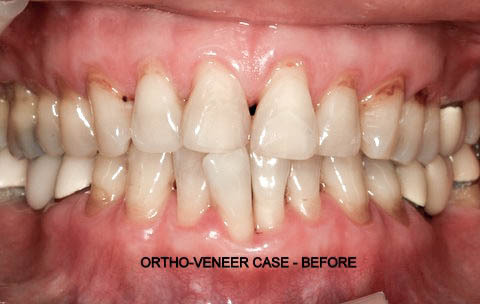 BRACES may be needed prior to placement of veneers to reposition crowded or flared teeth in a more ideal position, otherwise excessive grinding would be necessary. Many people who have teeth angled backwards, or have a deep bite, would require jaw orthopedic/orthodontic therapy to reposition their jaws and teeth for better jaw-joint support and lip support. They are not cheap, particularly considering the fact that 8-10 units are made at the same time. HOWEVER, we believe it is the best investment one can make to improve a smile. Consider the cost of buying an expensive car for instance. Your car is only visible to others for a short while throughout the day. Your smile, however, is the only thing that people see day in – day out, whether at home, at work, in social circles, in romance, in performing. It is practically the centerpiece of your image. It portrays beauty, self-confidence, health. The positive impact in image and self-esteem are so impressive and wide-reaching, that one can now say, for a tiny fraction of the cost of an expensive car, you can have much more. Is it necessary to have both upper and lower teeth veneered? It is advisable. 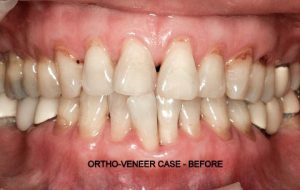 However, if your smile reveals the upper teeth more, and if your lower teeth are not terribly crowded or yellow, you can have just the uppers done. You could then whiten the lower teeth and observe. You can always veneer them at a later date. Since there is minimal grinding, bonding ceramic to the enamel of the tooth is the strongest bond one can achieve. Unless there are other complications involved, these should last a lifetime. 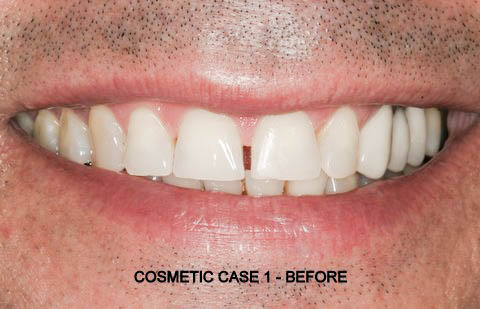 First appointment: Impressions and photographs are taken of the teeth. The teeth are surveyed to determine which surfaces would need to be minimally ground back, if at all. A computer imaging simulation may be requested to help in choices. The lab or the dentist may fabricate a simulated version of the veneers to serve as an aid in establishing a form that the patient likes. This final form will be communicated to the lab to reproduce when the final veneers are fabricated. Second appointment (1 hour): After minor changes are made to the teeth, impressions are taken. 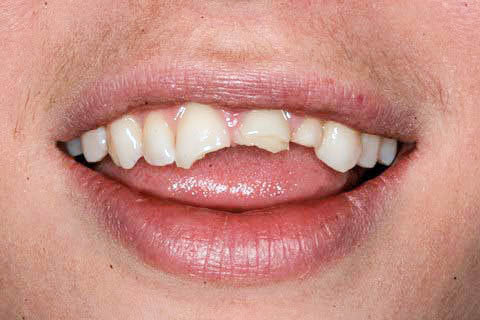 Temporaries are placed if there is tooth reduction. 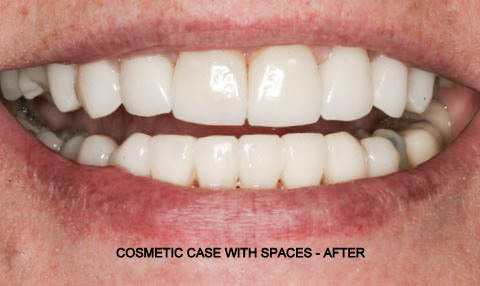 Third appointment (1-2 hours): The veneers are bonded on the teeth, polished and adjusted.